Because coffee is great and all. It makes us feel real good. And the smell warms our hearts. But we wouldn’t go so far as to call it a powerhouse food. Right? Thank you Erica Mesirov, our resident Food Coach for posting some of her favorite substitutes for regular coffee (caffeinated and decaf options). These options preserve the warmth, comfort, and general taste of her daily brew. But they add so much in the nutrition and healing department. Really revving up the benefits you can get from your java! This article includes links to Amazon to purchase, if you so choose. If you’ve hung around with me long enough, you know I heart coffee. I wake in the morning full of anticipation for my morning brew. And I go to sleep at night, dreaming of my coffee adventures for the next day. But what if I could make coffee healthier? 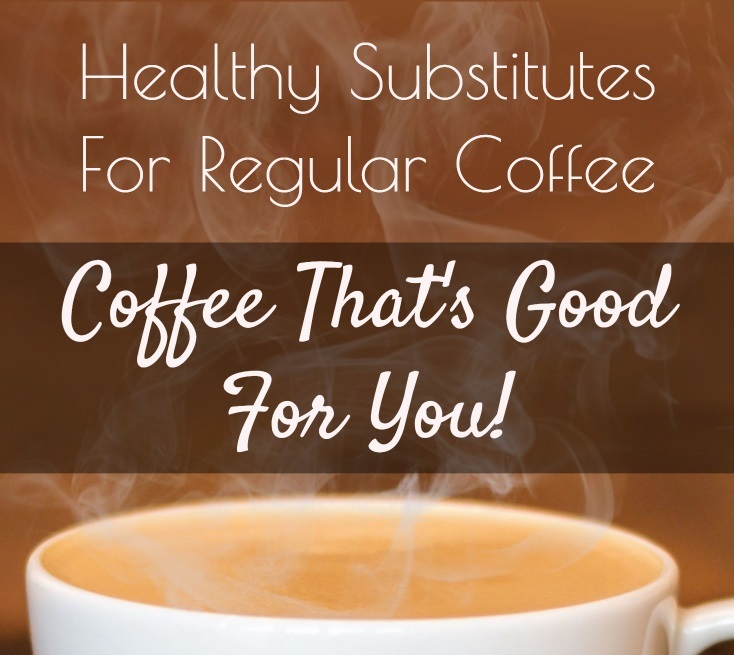 So here are some of my favorite substitutes for regular coffee. Dandelion root is good for the body in so many ways. It cleanses the liver to help the body to detox. It also assists digestion with improved bile flow. Since the digestive system is really the center of immunity for the body, this herb improves total body health. And guess what? You can brew it into an amazing, rich, java-like beverage. And while you won’t get the caffeine rush (and crash) of normal coffee. You’ll instead get the rush of your body working better and feeling lighter. Dandy is one of the big brands of dandelion coffee substitute. Buy a bag, brew it in your drip machine or in a tea bag, and serve with some cream. You’ll be singing its praises in no time! Oh, and it’s gluten-free! If you haven’t been living under a rock, you’ve probably at least heard of Bulletproof Coffee. And Bulletproof isn’t any old coffee. It’s a supercharged, super rich cup of brew. You make it by mixing Bulletproof coffee, grass-fed butter and MCT oil into one delicious drink. It’s high in fat, but the kind of fat that can be good to your body. But take note! You probably only want to indulge if you’re on a low-carb, clean diet. Those who drink it claim in can give them more energy. It can keep them full until lunchtime. And some even claim that it helps with weight loss. Though I imagine the weight comes with balancing the drink with an otherwise clean diet. So if you’re on a low-carb diet. Or you’ve been removing most of the processed junk and sugar from your diet. Or you’re eating clean but just want something new. Check this out! It might be the right thing for you. Teeccino coffees mimic the taste of conventional coffee. However, the ingredients are more of an herbal tea. The brew is a blend of grains, herbs, fruits, and nuts. And it’s naturally caffeine free! They have tempting flavors you’d find at your local espresso bar. Think caramel nut, pumpkin spice, and Maya Chocolate. They also have more traditional, stronger flavors like french roast, and dandelion dark roast. You can get Teeccino in tea bags for easy brewing. Or you can brew it in your french press, your coffee machine, and even make espresso shots. You can quite literally make any of your favorite coffeehouse drinks with it! As a side note, they have lots of gluten-free options which you can read more about on their website. But they have something for almost everyone. And they create great options for those trying to reduce their caffeine binge. Ayurvedic Roast takes the grains of barley and rye. And it mixes it with well known kealing herbs like Ashwagandha, Shatavari, and Brahmi. Which makes for an extremely healing, caffeine-free brew. Ashwagandha is a great herb for balancing to the body’s reaction to stress. It may also balance blood sugar and act as an anti-inflammatory. Shatavari assists in balancing the reproductive and digestive systems. Brahmi can help improve your mental performance. You will brew this drink just like it’s caffeinated counterpart. You can use a french press, a drip machine, or do a pour over. In the end, you’ll get a beverage that’s very similar in body and taste to coffee. Maybe not exact, but somewhat close. But instead of depleting your body, this drink can actually help build it up. The herbs can heal. And if you’re gluten-free, check out their website. There’s lots of great info to help you access how to drink this as part of a gluten-free diet. I love coffee. And I’m never going to give it up altogether. But I’m learning more and more to have the majority of what I put into my body being nourishing and health promoting. That’s why, as I said a few weeks ago, I’m drinking more green tea. But when I’m craving real coffee, there’s also better choices I can make. And this includes the supercharged options I’m talking about today. So, if you’re a slave to your conventional coffee maker, try to mix it up. Add something new to your regimen. And you’ll be surprised how these healthier options can bring joy to your ordinary java routine!